Welcome to the Award Winning Edmonton Airport Super 8. 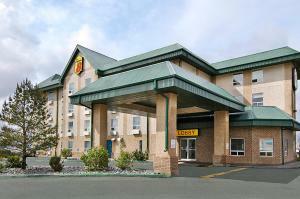 This conveniently located Super 8 is just minutes away from the Edmonton International Airport, restaurants, and shopping. We offer shuttle service to and from the airport with advance notice needed in the morning. All rooms offer free high speed internet, in room coffee, hair dryers, in room fridge and microwaves. The Edmonton Airport Super 8 is 100 percent smoke free and achieved the 2006 Alberta Hotel and Lodging housekeeping Award. Property is a Canada Select 3 Star. No Pets Allowed Long term parking with fee and limited availability. Please contact hotel direct to book. Rollaways 20 Dollars per day.